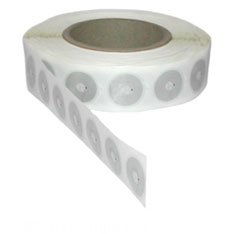 This NFC sticker is a 29mm diameter transparent sticky label that operates at 13.56 MHz wireless frequency and contains 137 bytes of usable read/write space for NDEF data. Based on the NTAG213 chip from NXP, this sticker offers advanced security, anti-cloning features as well as a permanent lock feature, therefore user data can be permanently configured read-only. The NTAG213 NFC chip features improved performance and is fully compatible with NTAG203 and MIFARE Ultralight C.
Supplied as transparent self-adhesive plastic labels. Please note - NFC stickers will generally not work if attached or very near to a metal surface, unless you use one of our all surface products.